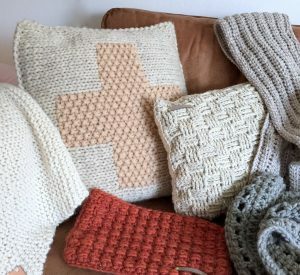 As I already told you in this blog post, a truly wonderful cooperation emerged from one of the fun crochet parties recently organized here in The Netherlands. 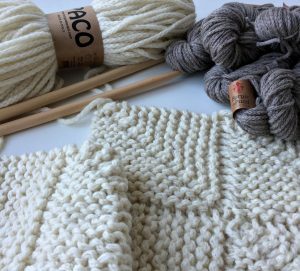 After the “Borgo de Pazzi”-party at “Trollenwol” the talented bloggers and instagrammers that attended immediately started crocheting, knitting, and even weaving with the beautiful Borgo-yarns. Bert Noorderijk, Borgo’s agent in The Netherlands, seeing the many projects we came up with on social media, suggested we all write down the patterns, and collect them in …… a magazine! 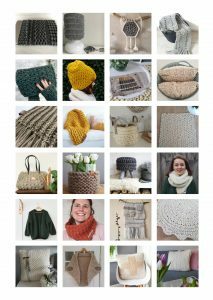 A very special magazine; you see, we – the 17 Borgo-babes, lol – have all donated our patterns, and in return Borgo de Pazzi is donating part of the proceeds of the magazine’s sales to a charity of our choice. 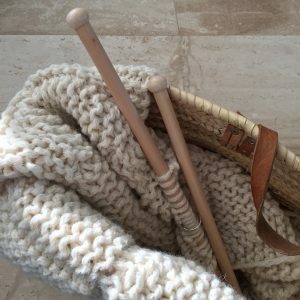 Knowing how much we, the-not-so-elderly-yet, enjoy and benefit from crafting together, we quickly and unanimously picked the Dutch foundation for the elderly, Het Ouderenfonds (English: here), and more specifically the “Let’s Knit Together”/“Samen Breien”-groups, that help the elderly connect and be less lonely by getting them together in craft groups. 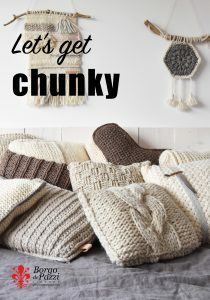 Since we all worked with rather robust and chunky yarns, it was not hard to – again: fast and unified – choose a name for the magazine: “Let’s get Chunky” seemed very apt right away. There are times when you know and feel everything about a certain project is right, and this is definitely one of them! I love our awesome group of makers, our mutual passion, the fun times we had, the a-ma-zing projects that everyone came up with, the fact that so many of us invested a lot of extra time (think: coordinating/overseeing the whole project, translating patterns in English, styling and photographing the projects created, designing the layout and putting the magazine together, etc). Also, we proved everybody wrong saying women can’t work together: there was nothing but a marvelous sense of care, love, wanting to help one another, as well as humor in this group of 17 women. I feel very, very proud to have been part of all this, and want to extend a big, warm, squishy “thank you” to my fellow “Let’s Get Chunky”-makers (whom you can all get to know better via the links under this post)! 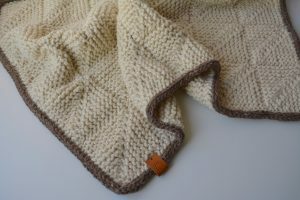 I’m also proud of the project I made for the magazine, my “Al Paco”-blanket! I have had my eyes on knitted mitered squares like ….. forever, and I so wanted to give them a try. 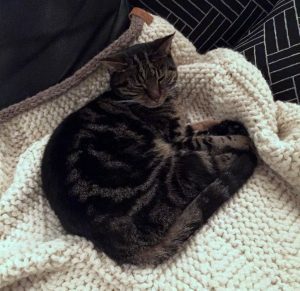 To be honest, it was a bit of a challenge for me at times (I’m not a very experienced knitter), but I’m happy I persevered: the blanket turned out just the way I had envisioned and hoped. And if I can do this, anyone can! “Let’s Get Chunky” will be on the shelves at the beginning of April (through Borgo de Pazzi-retailers, check here for a store close to you). You can also order it online (shipping internationally, e.g. here). It has 37 (that’s correct: thirty-seven!!) 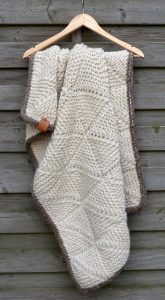 crochet and knitting patterns, in a wide variety ranging from home-decor items to shawls/hats, all written in Dutch & English. And guess what? All 17 contributors are running an extremely cool giveaway; we’re allowed to give away TWO magazines each: it pays to keep a close eye on everyone’s social media. Today is my turn to give away TWO “Let’s get Chunky”-magazines! So…. if you want a chance to win: leave a comment here, on my Facebook– and/or Instagram (sharing/reposting is always nice, but not necessary). The give-away is open for all, I will ship your “Let’s Get Chunky”-magazine no matter where you live, that is: if you win. So, hurry up and get those comments going on all my social media channels ;)! The winners will be notified Thursday, March 30. Het ziet er nu ook weer mooi uit Marianne, en …. gaat het breien net zo snel als je haken? I can’t wait to see what everyone has come up with and if I don’t win a copy I will order one online. What an absolutely fabulous idea…you Dutch girls rock!!! Much much love and a big hello to the others I know when you see them next. Aw…. thank you so much, sweetheart! That truly means a lot, coming from the Queen of Knitting herself – you know how much I admire your work! Isn’t it a great project? I will see a lot of the girls during the weekend, when we’ll be attending a new&hip craft fair (Creative Life); they’ll love to hear from you! Thank’s for this inspiring blog, love the pictures. I love chunky knits. 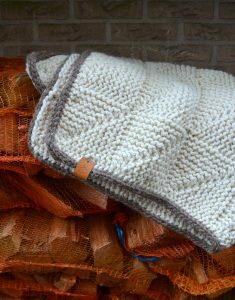 They are so textural, and give such fast gratification! Wauw wat ziet het er weer gaaf uit!! Zou hem heel graag winnen ???? En wat een goed doel hebben jullie uitgekozen, dikke pluim voor jullie allemaal. Mooi magazine volgens mij. Zou ik graag winnen. Fijn weekend. Wat heb je ons project en avontuur geweldig beschreven, ik denk dat jij verwoord wat wij allemaal voelen en beleven, heel mooi. Ik ben ook zo blij en trots om hier deel van uit te mogen maken. I will ask my husband to find a copy when he is over next as the shipping is very expensive – but I have to have it! What a lovely collaboration! I would like to know if it is possible to purchase the Let’s Get Chunky magazine and have it shipped to the United States. I love the projects in it and would greatly appreciate the help. Thank you so much for checking! I did try to purchase on CR Couture but the US wasn’t included in their choices for shipping. I’ll be looking for for any further news.